The main gate with its archway which says “Freedom Through Work” or “Work Makes You Free”. New arrival prisoners would pass under this sign and hear a “orchestra” playing. Every day thousands would march out to their slave labor assignments and return carrying their dead fellow prisoners. 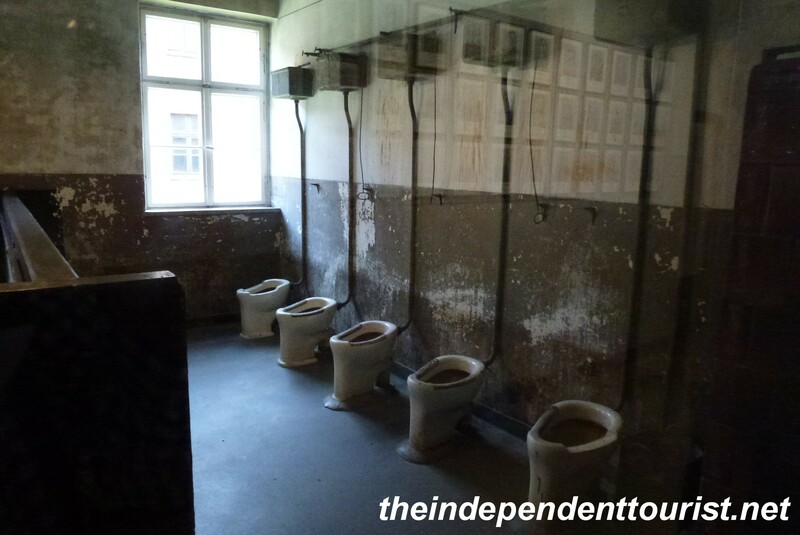 Auschwitz is one of the most infamous and well known set of Nazi concentration camps from World War II. 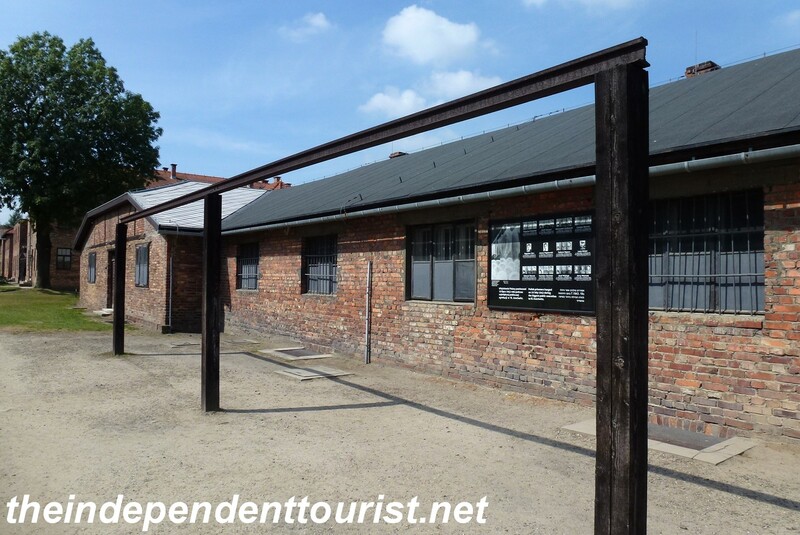 There are actually two main camps open to tourists, known as Auschwitz I and Auschwitz II (or Auschwitz-Birkenau). 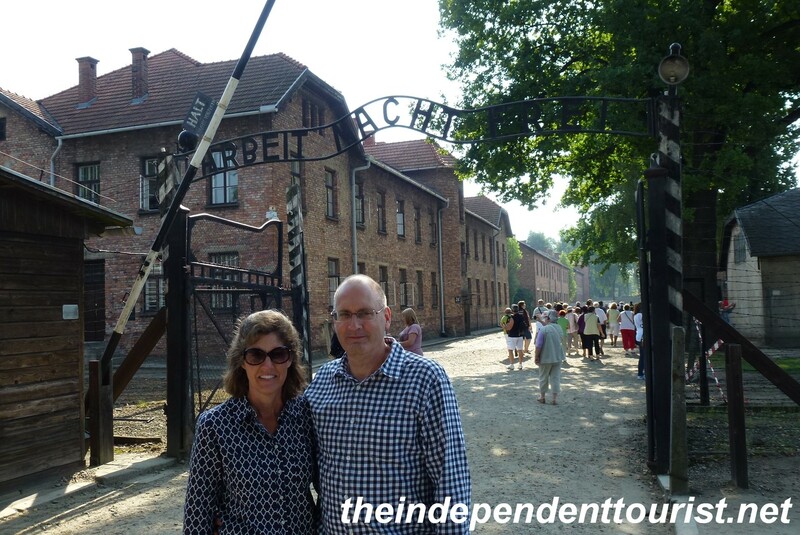 This post will focus on Auschwitz I. I will share more about Auschwitz-Birkenau in a separate post. One of the fence lines at Auschwitz I. 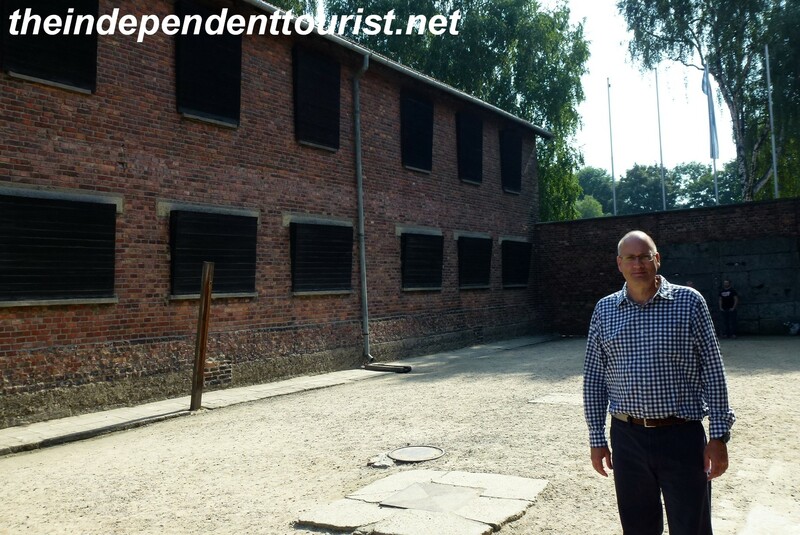 The building behind me was where the confiscated belongings of the prisoners were kept, along with the supplies of the poison gas. Auschwitz I was originally a Polish Army barracks and was turned into a concentration camp in 1940 on the orders of Heinrich Himmler, after the fall of Poland in 1939. 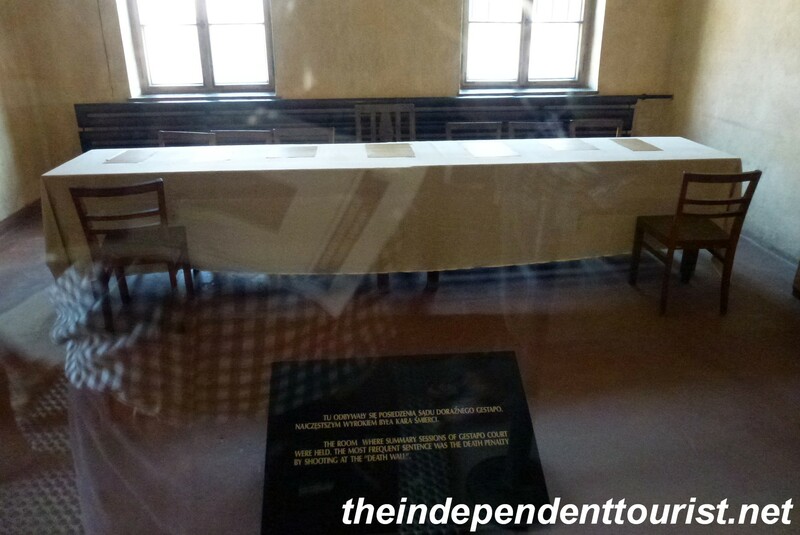 The first prisoners were mainly Polish men who were political prisoners of the Third Reich. Eventually others were sent here, including Polish women, Jews from all over Europe as well as Soviet prisoners of war. Soviet POW’s came to number about 10,000 starting in 1941 and were sectioned off in the camp to certain blocks (buildings). Within 5 months, 9,000 had died, due to hunger, brutality, exposure to freezing weather or being gassed. In the center of this area, the SS officer in charge of the roll-call would receive reports of the prisoners present. If anyone was missing, the prisoners would have to stand at attention until the SS were satisfied, regardless of the weather and sometimes for 12 hours or more. The gallows, where many prisoners were hung as a warning to others. In July 1943, 12 Poles were hung, suspected of helping 3 prisoners escape. Anne Frank (whose diary as a young girl about life in hiding from the Nazis in Amsterdam has been widely published) was held here but was later transferred to Bergen-Belsen camp where she died. Her father, Otto, somehow survived Auschwitz and returned to Amsterdam after the War. Another famous prisoner was Viktor E. Frankl, who wrote the book Man’s Search for Meaning based on his experiences at Auschwitz. The crammed barracks. Sometimes 200 people were crowded into rooms mean to house 40 or 50 people. 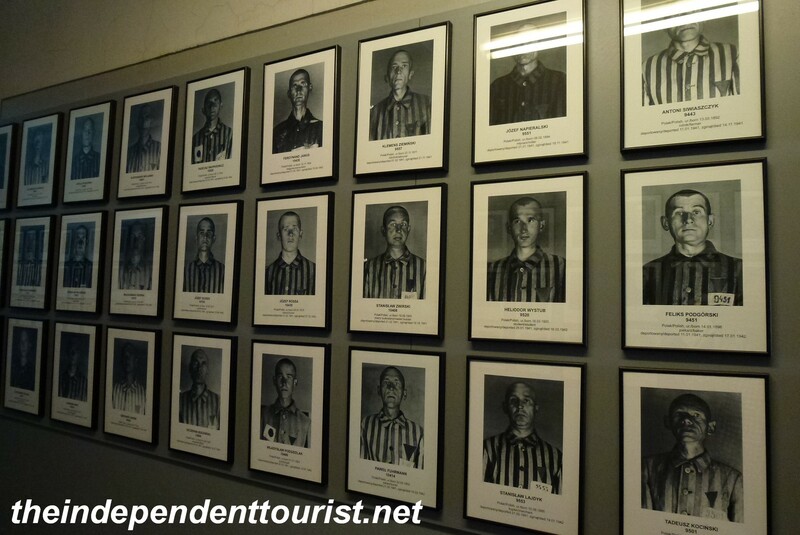 Some photos of victims at Auschwitz I. All in all, about 400,000 men, women and children were sent to Auschwitz I. At any given time, 13,000 – 16,000 would be housed in the camp. Due to the horrific conditions as well as the outright execution of numerous prisoners, the mortality rate was high, about two-thirds of the prisoners did not survive. The room where execution decisions were made. (The poor picture quality is due to reflections on the glass in front of the room). The infamous yard bertween cell Blocks 10 and 11. Block 11 was known as the “death block.” Prisoners were tortured and shot here. From 1941 to 1943 several thousand were shot by the SS on this spot. Floggings also took place here and torture, such as being hung from a post by your wrists tied behind you. In the basement of cell Block 11 are a number of torture rooms. We were not allowed to take pictures inside that area. This was the only concentration camp where prisoners were tattooed to aid in identification due to the large number of corpses. There were 700 attempted escapes, about 400 were recaptured. If a Polish prisoner escaped, his family was rounded up and sent to Auschwitz, and made to stand under a sign indicating why they had been arrested, as a warning to other prisoners. Initially, the mass killing of Jews was not part of the purpose of Auschwitz; it wasn’t until about 1943 that the Germans started perfecting their gassing techniques and killing Jews by the hundreds of thousands in Auschwitz-Birkenau. However, Auschwitz I was one of the experimental locations for large scale gassing operations. 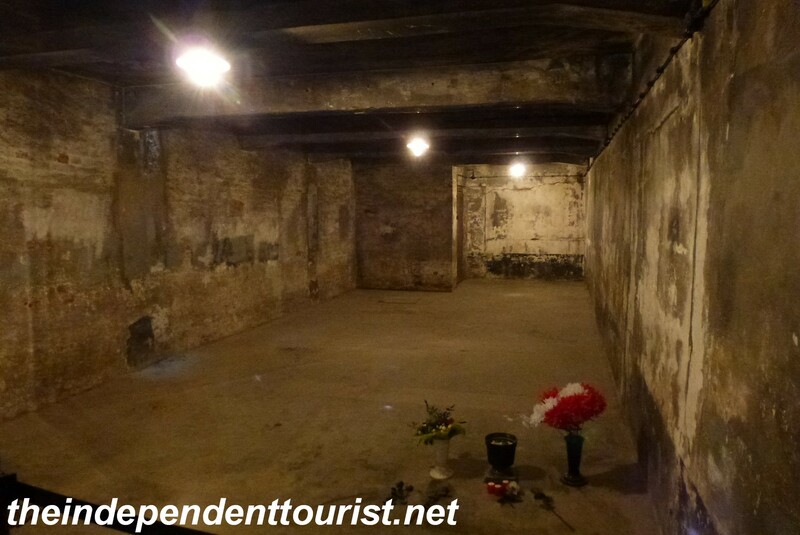 Originally an ammunition bunker, this room became a gas chamber during the years 1941 – 1943. Thousands were gassed here, some immediately upon their arrival, including Jews, Soviet POW’s and some Polish prisoners as well. Pellets of Zyklon B were dropped through the ceiling. 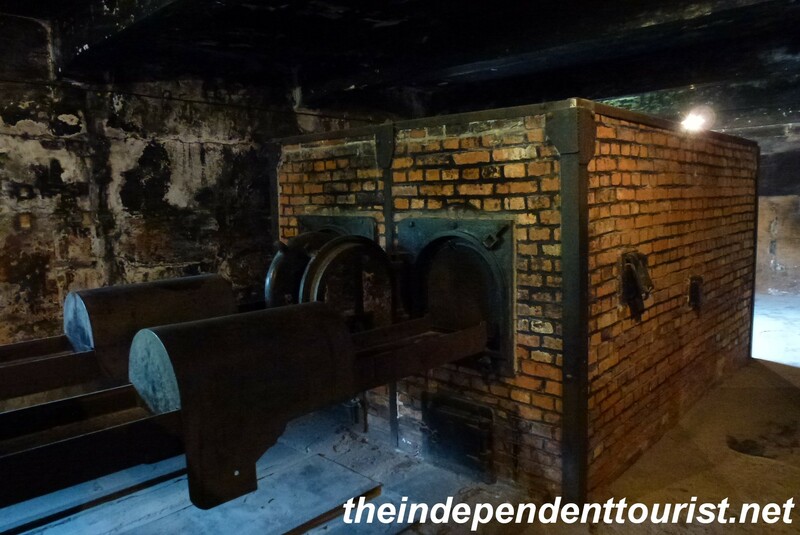 The ovens at Auschwitz I, which each could burn 2-3 corpses at a time and up to 350 per day. In July 1943, the burning of corpses stopped as the killing operations were moved to Auschwitz II. Auschwitz (Oświęcim is Polish) is about 67 km (41 miles) southwest of Kraków and can be done as a day trip. We visited on our way into Kraków from Częstochowa. Allow at least four hours to see both camps, which are about 3 km (2 miles) from each other. 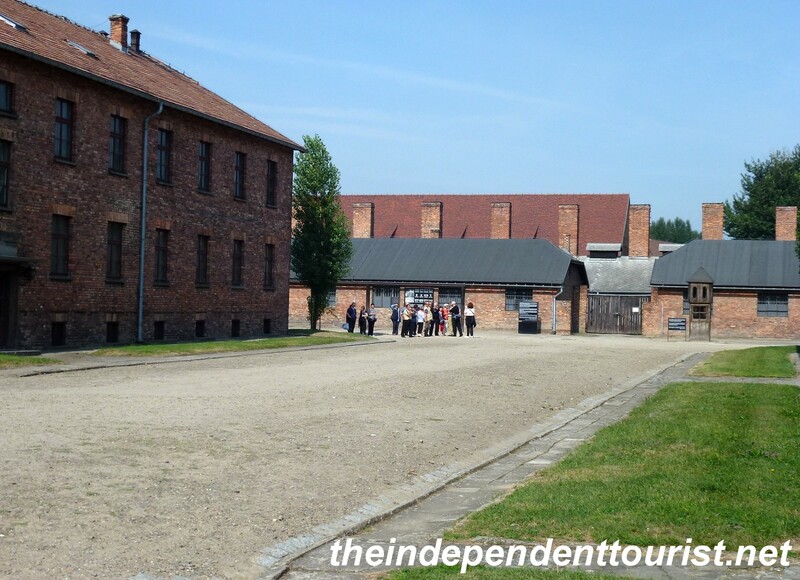 Get your tickets and guide maps (essential) at Auschwitz I which is right next to the town. Auschwitz-Birkenau (also called Auschwitz II) is a much larger site, slightly farther out of town. Tours are available, but we felt the guidebooks did a great job explaining the history and operations of the camps. Also note if you get to Auschwitz I after 10 am (as I recall) you’ll be required to take a tour and won’t be able to walk around on your own. 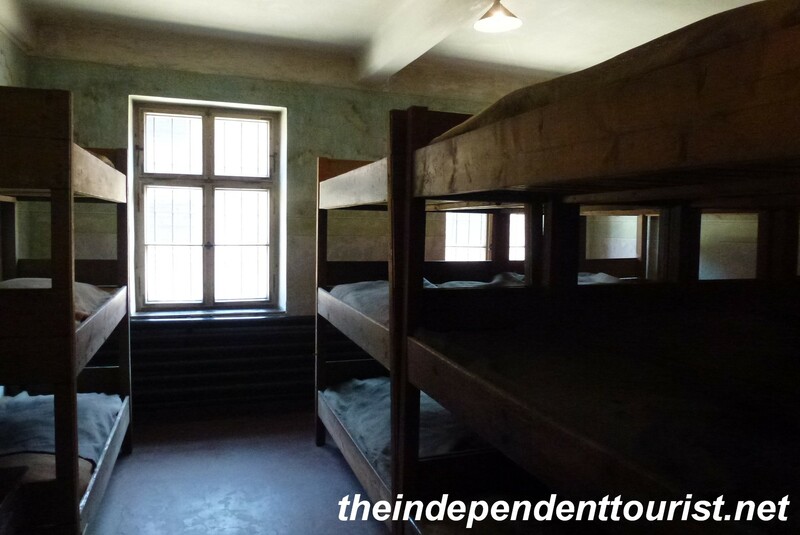 In Auschwitz I, many of the barrack buildings house different exhibits on life in the camp, the history of the holocaust, and experiences of different cultures and countries during the War. Be forewarned: A visit here is gut-wrenching and depressing. However, the exhibits and information are well organized and almost overwhelming. Understanding this dark period of the world’s history is important so that we will never allow something like this to happen again. References: Site plaques and brochures from Auschwitz. For an excellent review of the history of Auschwitz, read Auschwitz: A New History by Laurence Rees. 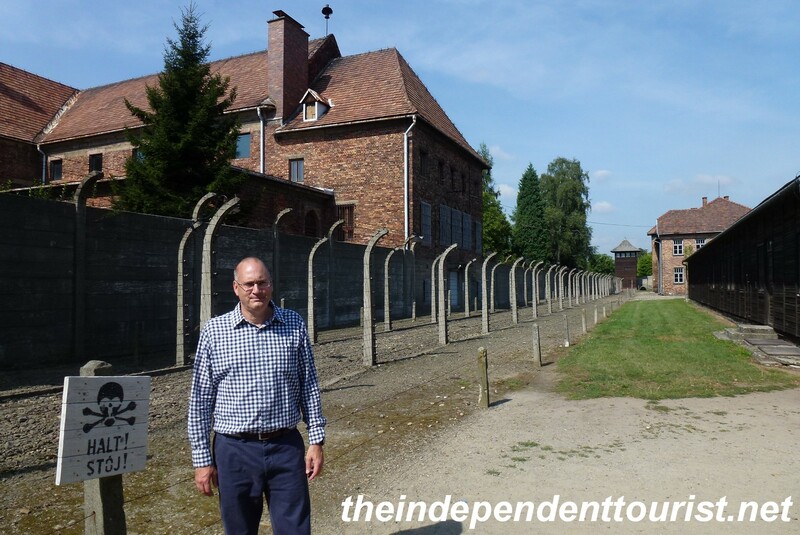 Posted in Poland and tagged Auschwitz concentration camp, Nazi concentration camps, Things to see near Krakow, Things to visit in Poland on September 22, 2014 by Paul Terry.